Digital Tyke is inviting talented writers to team up with us in our journey forward.If you are a talented writer who want to vent frustration via writing as well as share your aspiration about a good world, you are perfect for it. 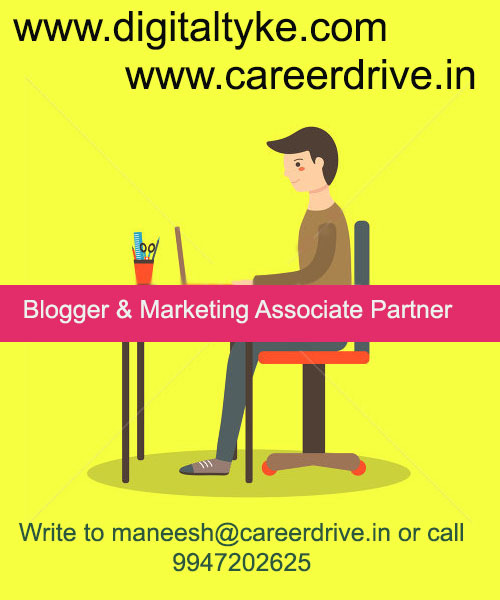 The only way to get enrolled to Blogger & Associate Partner Program is to get one good post of your's published on www.digitaltyke.com . The only way a blogger & marketing associate makes money is through informative & useful sponsored posts. Digital Tyke is monetized by advertisements.He / She should be a person with positive attitude and should introduce our blog to online marketers & brands. If you simply refer a prospective client to us, you will get 25% of the sales.If you handle the sales, write the blogpost, you will get 50% of the sales money.